The Holy Martyrs Ermil and Stratonik, by origin Slavs, lived at the beginning of the IV Century during the time of persecution against Christians by the emperor Licinius (307-324). They were friends. 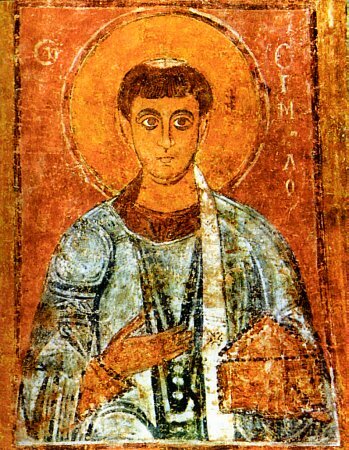 Saint Ermil served as deacon in the city of Singedonum (Belgrade). Condemned by Licinius to imprisonment, he was long and cruelly tortured for the Name of Christ, but he remained unyielding. 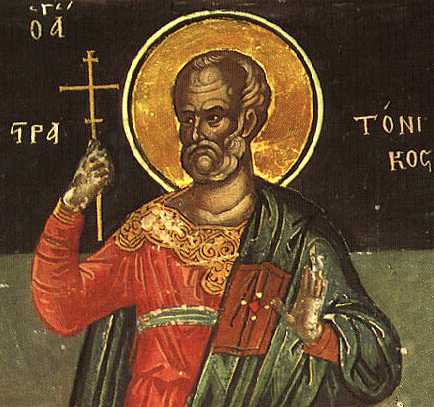 Saint Stratonik was a superintendent of the prison and a secret christian. Seeing the agonising torments of his friend, he was not able to keep from weeping, and he revealed that he was a christian. They subjected him also to torture. After the torturing, they put the martyrs into a net and threw them into the Danube/Dunai. On the third day, the bodies of the saints were discovered on the bank of the river by christians and buried near Singedonum. Their venerable heads are located in the Church of Saint Sophia, where the Russian pilgrim Antonii saw them in the year 1200.